Basically we will learn about different role creation and management in test link. As we know admin has all rights to create different users.Admin can create users but he cannot edit or delete a user’s password. Only he has right to create it. Afterwards user can edit and delete his password and generate API keys for a test project. There are several rolls in Test link which is define below. Guest:A guest can see all the information like test cases, metrics, reports etc. but he or she cannot edit any information. Test Executor: Tester can execute all the test cases which are assigned to him. He has no rights to run other test cases of another test project. Test Designer: Test designer can create, delete and edit test cases and test suits. He can create test cases for assigned test projects. Test Analyst:We can say senior test engineer as test analyst. Test analyst has all the rights like create test cases, edit it, delete it, execute test cases, create report for the project etc. Test analyst has major rights for manage test project. Test Lead:Test lead has same right as test analyst. They have all the permission and ability to manage the test project, test plan, assign rights, create test plan, create metrics report etc. in addition test lead have more authority then test analyst. Admin:Test link truly dependent on admin. Admin is the first person who can create all test project and user so whole management in test link is related with administration. 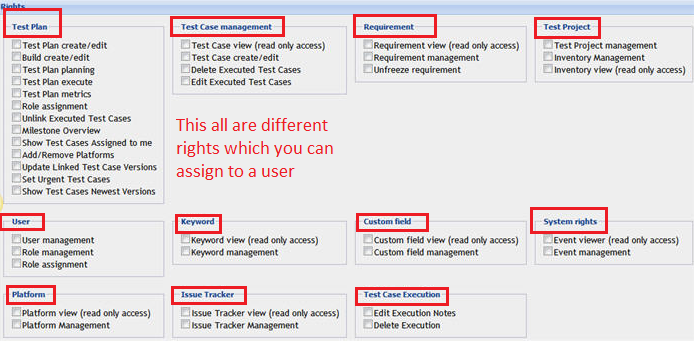 This all are the different roles which we can create in test link and as per created user we can assign different rights to the different user. Now we will create a user in test link as per below steps. Now log in with test link and navigate on home page.You can see the “User/Roles” button on the bar. Click on it and you will navigate on another screen where you need to click on “Create” button. Afterwards test link will navigate you on below page. Here as per screen you need to enter Login ID, First Name of user, Last Name, Password, Valid email address, Role and do check mark on Active button. It shows that user is in active mode. Once you remove check mark on it. User will be inactive in test link. Now click on “Save” button. This is simple steps to create user in test link. “Role” tab is identification of a use. 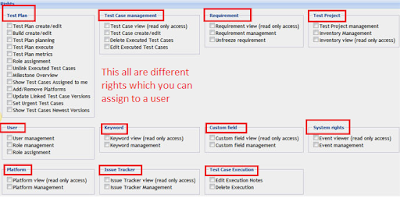 As per user’s role you can assign project and test plan and test case execution rights so make sure that you have selected proper role when you have created user in test link. Now moving forward we will assign project to role. 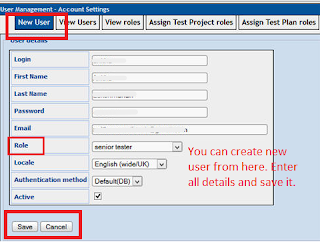 You need to click on “Assign test project roles” it will navigate you in below screen. You can see here drop down button in screen. You can select user from drop down menu and save it for a test project. First of all you need to select test project so accordingly you can select user and assign proper role as per requirement. Test link also gives us a functionality to provide rights to all users as per his role. As we have discussed above, all user does not have all the rights. For Example, Test Executor only able to run the test cases where as Test analyst can create, edit, delete and assign test cases to another user. Thus as per the user role we can assign different rights with use of below screen. As per your requirement you can check mark on given rights and then you need to save it so accordingly that rights have been given to the role. 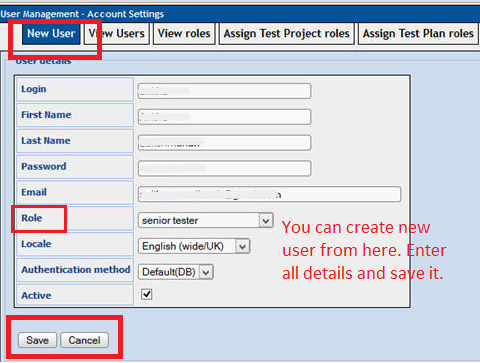 Afterwards user can work in test link as per assign rights and assigned role. This is all about, how test link manage role and users for different test project.